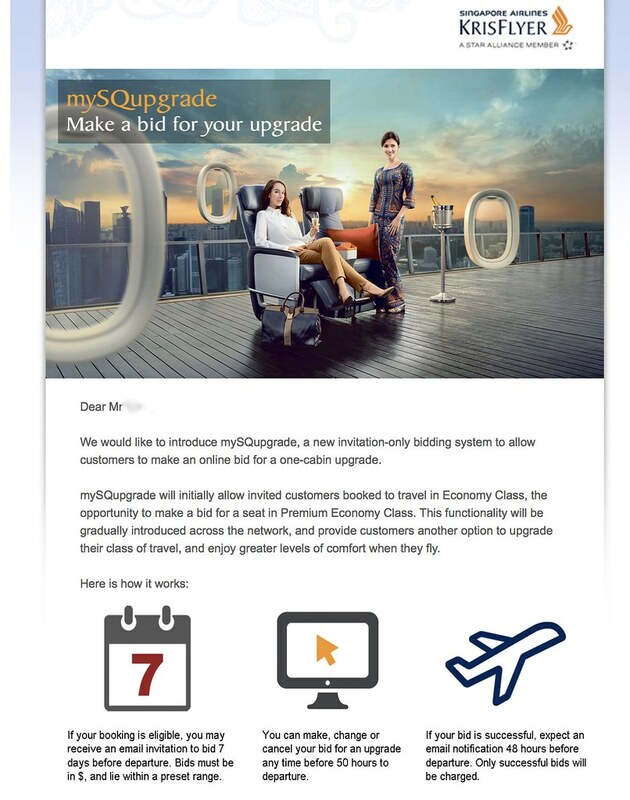 Just got an email SIA is introducing a bid upgrade from economy to premium economy. It's a bidding upgrade prior 7 days before your travel subject to availability. Seems like QF bid upgrade but QF allows J upgrade bid while SQ is only from Y to S.
Kudos to SQ for introducing new feature but not allow J upgrade bid seems abit sad. Perhaps S class not very popular so they using this to push. Sounds like a good idea...let's see how generous the bidding levels are. I personally think that SQ shouldn't go down this path. This bidding for an upgrade is more viable for airlines of the LCC model. There is only so much you can do, and once you try too hard, things will only go downhill. I have tried the PEY, and my personal opinion is that it is over priced with nothing really to shout about. If you want to travel in comfort, go for it all the way, and do JCL with the flat bed. I wonder if the original fare bucket is a factor in whether the bid or not is accepted. Would this assume that once somebody has made a valid bid, that their place in the standard Y cabin can then be automatically resold, or at least become part of a pool that can be allocated to either Y or S as a whole? Only from economy to PEY? For now this looks like a band aid for PeY's dismal showi g. For an ambitious project that has a $100m refit budget only to see the entire exercise suspended midway through and now this Y to S class upgrade,the signs certainly does't bore well and i suspect some heads might roll in management and Mr Goh is probably at his Wits end and SQ as a whole is facing a massive pricing pressure from a wide range of competitors. So far i never get free upgrade from SQ to PEY as KFEG member , when i travel with BR or CA always get free upgrade from economy to premium economy sometime to Business class . I was just thinking about that. Say someone books a K ticket, and another a Y full fare ticket. Both get invited. on an extremely empty flight at the back. K pax bids $500, Y pax bids $100. Does SQ let the first go through - since it's just more revenue - or the second - since Y fare +$100 is probably a higher overall fare? Just like with redemption upgrades propably are for full paying Y and not discounted tickets. But really this would be at SIA discretion. Anecdotally I have heard the opposite, at least during the initial launch phase for PEY. With PY fares 2 to 2.5 times Y Super Saver, it is really hard to justify the marginal enhancements. For example, flying in Apr 2017 on SQ32/31, Super Saver costs S$1,370~, while PY is S$3,545.~. it's like following Emirates and even MAS on this Upgrade and would think will extend to EY upgrade to J class in near future. However of course, there will be a min amount to bid. This. PY is a bit better than Y, but no way will I pay THAT much. Especially since from my home airport (MNL), J tickets are typically "only" 3-4x Y tickets. I'd be surprised to see this for upgrades to J. I'd imagine SQ wouldn't care too much about "dilution" of exclusivity in PY, whereas they would probably be a lot more cautious about letting that happen in J.